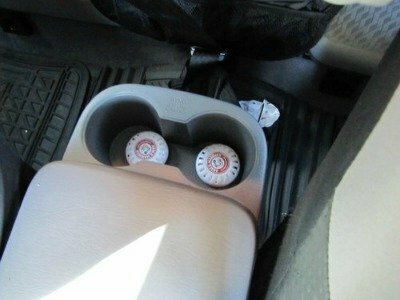 Here's a review of Munchkin Arm & Hammer Nursery Freshener discs from someone who used them in a bit of a different way, to try to freshen her car. 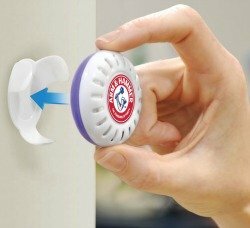 However, before I share that review I thought I'd share what these little deodorizing discs are, and what they're meant to do since the use reviewed is slightly outside the norm. These little discs are filled with baking soda, which as we all know can absorb odors. Plus, these discs have a light added scent of either lavender or citrus scents. Their suggested use is to place in diaper pails, diaper bags, on changing tables and in hampers, or other places in your baby's nursery where you may need some freshening of the air. They are actually quite small, as you can see in the picture of them in use to the left. To keep them in place in certain locations where it wouldn't be good that they were loose, you can buy brackets to mount on the wall or other surfaces that will hold them in place (also shown in the pic to the left). Just like when you add baking soda to your refrigerator to absorb odors, these little discs don't last forever. It is suggested that you replace them every 90 days or when they lose their effectiveness. Now, I have not personally used this product, but Carolina Diesen shared a picture of using the product in her car, and she wasn't impressed. used the pack of 5 in my Toyota Tacoma truck that doesn't see a lot of people or animal traffic, so I expected to be overwhelmed by the scent. Not at all the issue. Use dryer towelettes instead. You'll have better luck if you're just looking for a clean scent." Of course, this isn't their intended use, plus it seemed she wanted the air to have a nice scent, not to just remove stinky odors from the air. 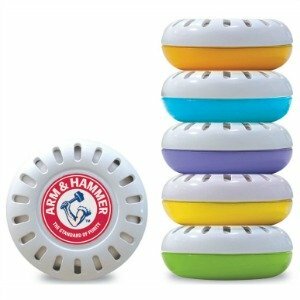 Therefore, I would love to hear from others who've used these little discs telling me how you liked them, good or bad, especially if you've used them for their intended use. Did it help neutralize the odor from such stinky areas as the diaper pail? You can share your air freshener reviews here for this or any other brand, or click the link to read others that have already been submitted. Further, I hesitate in whether I would call this product a natural air freshener or not, since although it uses a natural product, baking soda, mainly, it does contain scents and I cannot find any indication of whether these have natural origins as well, or not. However, if you're using this in a baby's room perhaps you are interested in more eco-friendly items so you can click the link to read reviews of such products that have already been submitted. Join in and write your own page! It's easy to do. How? Simply click here to return to room air freshener.